on-ground reality of restoring our urban bushland habitats. Backyards, parks and even unit block balconies represent habitat opportunities for our native flora and fauna. Examples include Garden for Wildlife Alice Springs, The Wildlife Trusts in UK and the National Wildlife Federation Garden for Wildlife in USA. 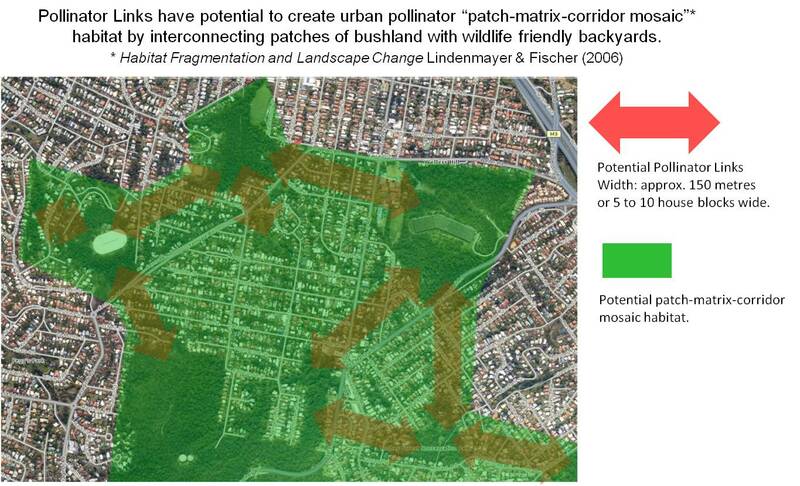 The Pollinator Link concept takes this a step further to focus on linking patches of bushland habitat in our urban environment. 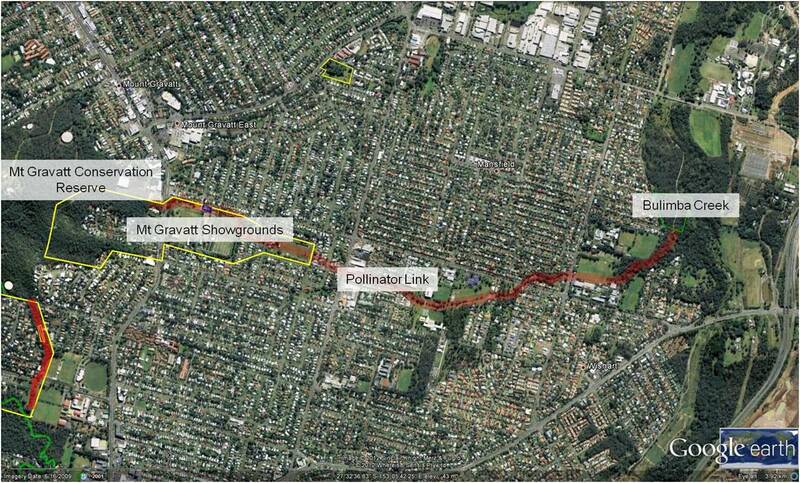 I developed the concept when I was struggling with the issue of creating a wildlife corridor linking Mt Gravatt Conservation Reserve with Bulimba Creek via Mt Gravatt Showgrounds. The on ground reality is that any effective link through the Showgrounds would hit a wall of houses and backyards. Being able to fly, our pollinators’ – birds, butterflies and bees plus moths, insects, flying foxes, micr0-bats, capacity to cross man-made barriers like roads and fences means they have potential to make an important contribution to ecological biodiversity. My inspiration for the Pollinator Link model came from the Pollinator Pathway in Seattle and the High Line in New York. Identify sites to be linked. This entry was posted in Bushcare, Bushcare Articles, Mt Gravatt Conservation Reserve, Pollinator Link and tagged Birds, Bob the Beeman, butterflies and bees, Pollinator Link, Urban wildlife corridors, Wellers Hill. Bookmark the permalink.